There is no more dreaded piece of writing a creative has to do than the artist bio or artist statement. We’re fine making the work — but why is it so hard to articulate it? It feels fake, it feels phony, it feels like we’re trying to oversell ourselves or trick people into buying us more than our work. Sometimes the creative process feels like magic, and we don’t want to examine it too closely, for fear that the magic will disappear. Often we’re much better at talking about our work in a group of creative peers, but we just freeze when we have to write it down. We can’t launch a project into the world without an About page, a Bio, or some kind of Artist Statement, so we’d better face our fear and get comfortable with writing about ourselves. The Art Can’t “Speak For Itself”. As the creator, we have spent more time with a piece of work than anyone. We know what we were trying to achieve, and what our inspirations were. But we live inside these thoughts for so long during the creative process that what seems obvious to us is not so easily read from the art alone. Depending upon what use you are putting this statement to, there may be specific guidelines given to you (like a statement for a gallery show) or more freeform (the about page on your website), but both need to convey what you and your work is all about. Check out this fabulous checklist and use it to organize your thoughts. Consider Your Audience. Think about your fanbase. What kind of people do you ideally want to be attracted to your work? Build a mental picture of your perfect fan, then write the statement as if you were talking directly to them. Then focus it by considering the place the fan will be encountering your work. A gallery with an older, established art collector clientele is going to need a statement in a more literary and serious voice than a young low-brow gallery whose patrons are mostly other artists. Are you writing for a magazine? Who buys that magazine? What is their target audience? Are you writing for collectors or other artists? Tell a Story. Remember, people don’t only want to appreciate your work, they also want to be intrigued. They want to get to know the personality that created this work, and what their motivations were. This is hard when you might not know what your motivations were while you were making the piece. It’s time to step back and apply a bit of self-reflection and see where the work fits into your career so far, or maybe doesn’t fit in. There’s a story there whether you know it or not. What inspired you? What parallels can you draw to your inspirations? What were you trying to achieve? What are the most important things in your life, what are your morals, what are your life experiences? Do they come through the work? These details can often give a viewer a deeper appreciation of your point of view. Remember to talk about yourself in the first person — writing about ourselves in the third person makes for very awkward writing and feels less authentic. Selling the Art or Selling the Artist. 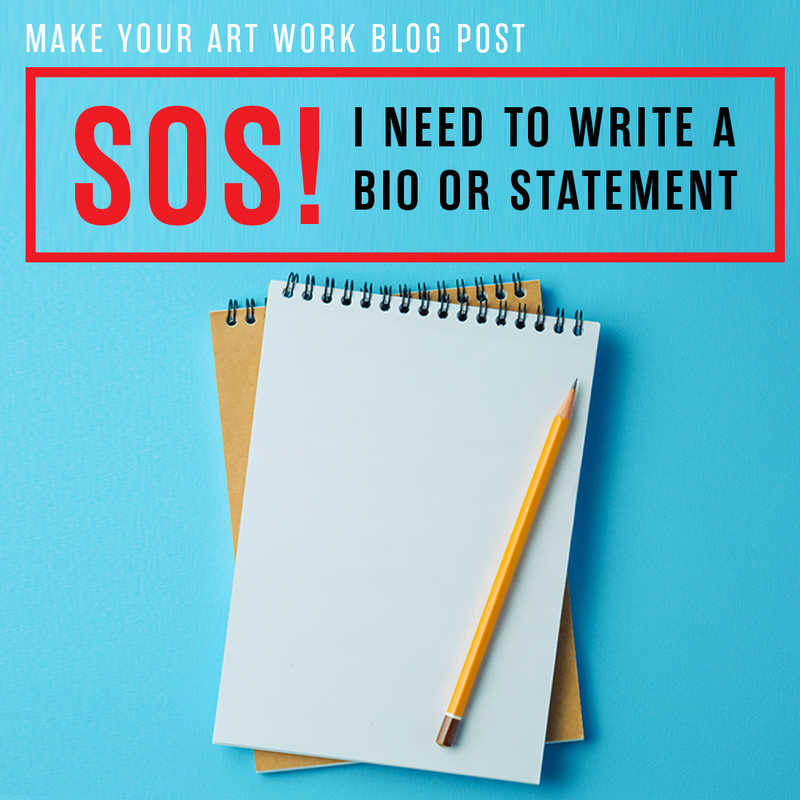 Many artists get uncomfortable with writing bios and statements because they feel like their work is more important than who they are, and the work should be the star of the show. Often artists and creators feel insecure trying to balance between self-promotion and arrogance, and we err too much on the “safe” side, and don’t promote ourselves at all. Women are especially susceptible to this attitude because studies show that society judges a confident woman more harshly than her male peers. We all know creators who have become egomaniacs and their personality has eclipsed their work. We fear becoming them, so we pull back on talking about ourselves too much. But, as I said above, you really can’t divorce the art from the artist, and the mind that created the work is as important to consider as the work itself. Remember a bio is about you. 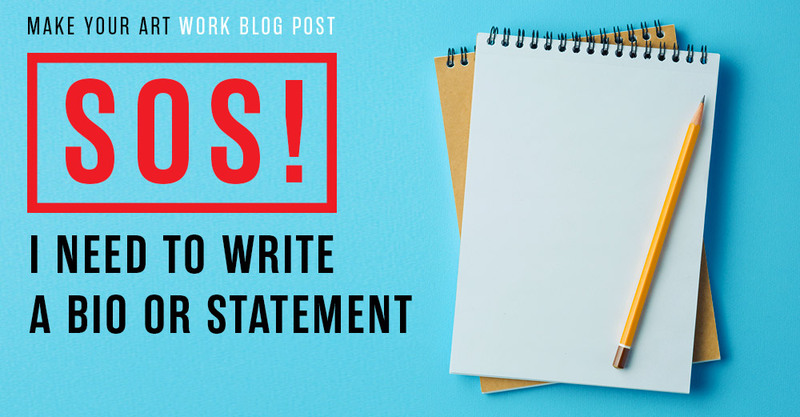 A statement is about your work. Again, sometimes you’ll write these as one document, sometimes they’ll be separated, depending on the requirements where you’re submitting the work. Conscript Help. Sometimes when we’re really stuck, it may help to get a peer or friend to tell us what they think of our work. A friend is good for the personal side details, and a peer int he same field is better to talk about the work, and help see the inspirations swirling around it that we may not be conscious of. A peer will also be used to talking to the same target audience and can help you craft your message to appeal to that audience. Maybe you and your peer can exchange bio/statement services and help each other out. Then when you think you are done you should send it to a few friends and peers to proofread the statement for you, and make sure it flows well and makes sense. S, M, L, XL. Once you have a statement or bio that works for you, do a few versions and line them up by size. A large statement for a website about page or a press interview. A shorter one for inclusion across social media platforms. A medium one for magazines and journals and event programs. Editing the bio into different sizes often helps you craft better phrasing and less dead space. Bring those more elegant wordings back into the original version. Remember the best way to figure out what feels right to you is to look at other artists’ bios and statements. Look up the social media profiles, bios, and about pages of your peers and the artists that inspire you. See what tone and voice feels better or worse to you. Here’s a good one by Make Your Art Work cofounder Marc Scheff. Here’s a list of some good short ones to build off of, with some pointers. Read a dozen and you’ll have a list of what feels right and what feels awkward. Remember to keep in mind the audience and the use. And most importantly: Remember to Spell Check! Great info here, thanks for sharing! Definitely going to revisit my artist’s bio after reading this.